﻿WHO: Gear Sector, manufacturer of high quality, military grade weapons components and accessories such as grips, light mounts, optic mounts, slings and sling attachments, etc. WHAT: Gear Sector Handstop, a small, CNC-machined aluminum handstop which attaches securely to a 1913 picatinny rail with a hex-key screw. One side is "smooth" and comfortable against the palm of the hand, the other flattened and "sharp" which is ideal for support against barricades. The Gear sector handstop retails for around $40. 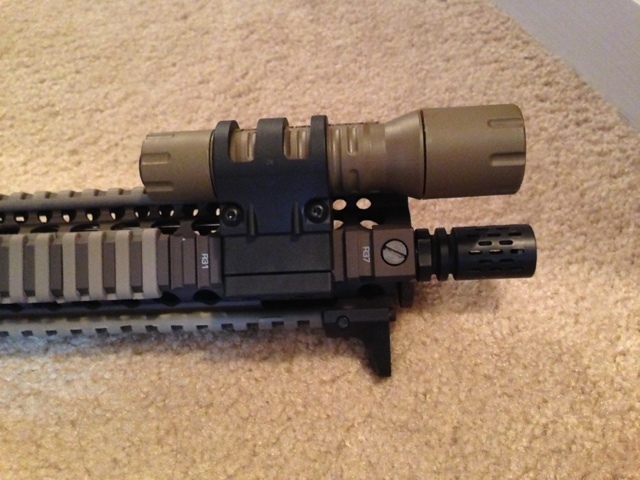 WHEN: I have been employing the Gear Sector handstop for 5 months now on a mid-length AR-15 rifle. WHERE: This handstop has been employed in 3-gun competition over my time using it. The Skinny: I really like the gear sector over a couple other handstops/forward grips I have used. It is incredibly comfortable, lightweight, and produces a "bite" into a barricade should you need it. I have pretty much exclusively moved to handstops from vertical grips and the Magpul AFG. Those types of grips are just too heavy and bulky for my use. I think the Gear sector is one of my top choices for a rail-mount forward weapon control device. The downside of this handstop is if you are using a tube-style free float rail. When using the Gear Sector with my Samson Evolution rail, I had to install one of the short picatinny rail sections on the bottom of the rail to install it. This left an appreciable, sharp "ledge" on the bottom of the rail as well as adding some unnecessary weight to the muzzle of the rifle. While this is not a deal breaker, a direct mount to the newer style tube-rails would be perfect. Also, it is a bit pricey for a tiny piece of "rail estate." FINAL WORD: 8 out of 10 (preferred), with points off for price and picatinny mount-only.